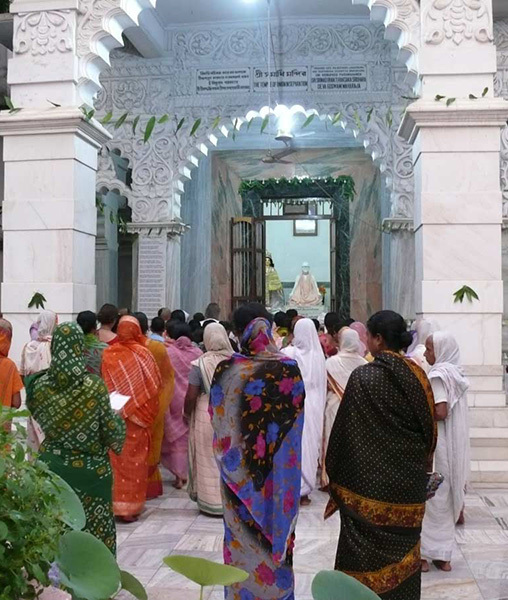 After the arati at the Temple of Love and Affection, devotees continue the arati at the Temple of Union in Separation. 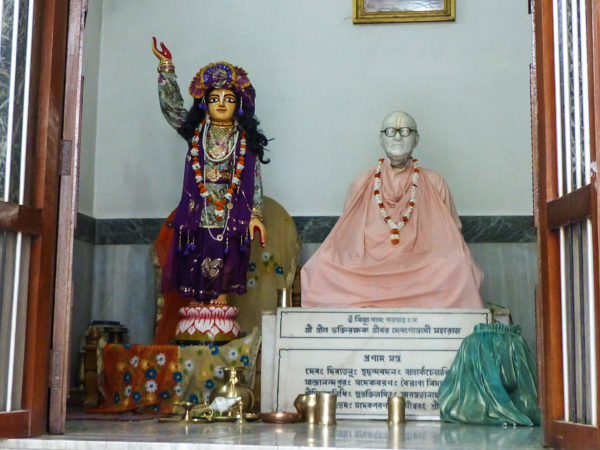 All glory to Srila Guru Maharaj, Srila Bhakti Raksak Sridhar Dev-Goswami, the leading general of the tridandi-sannyasis! You revealed your Pastimes in this world as the saviour of the fallen and delivered the sinful and unfortunate souls. Beholding your intensely merciful form, the fortunate souls faint with divine love. Your lofty, delightful form is an abode of divine emotion and filled with divine lustre. Your eyes are illumined with divine knowledge. Your form is adorned with tilak, tulasi beads, sandalwood paste, saffron cloth, and golden radiance like that of the sun. The extraordinary beauty of your divine form shines with the exalted joy of benevolence, the brightness of divine sweetness. You are endowed with inconceivable genius, affection, gravity, and magnanimity. You are a thunderbolt atop the mountain of mundane knowledge, and the conduit for divine revelation. You are the abode of the joy of Sri Gauranga's sankirtan dance, and you are always filled with divine love as you call "Dayal Nitai". The play of your divine Pastimes at Hidden Govardhan Hill in Sri Gauranga's abode are manifest eternally. You are revered by the assembly of Gaudiya Acharyas. Your neck is adorned with the jewel of Gaudiya-siddhanta. You are the mine of the siddhanta revealed by Sri Gauranga and Srila Saraswati Thakur. You discovered the divine meaning of the gayatri mantra. Unanimously all of your godbrothers see within you the revelation of Sri Rupa and Srila Saraswati Thakur. Seeing you chant the Holy Name with tulasi beads in hand, everyone remembers Prabhupad Srila Saraswati Thakur. The shelter of your feet, which are cooling like millions of moons, is our hope to attain the nectar of Sri Sri Radha-Govinda's Pastimes. O manifestation of the principle of inconceivable difference and nondifference (union in separation)! This humble servant chants your glories and worships you with joy.